黒い虹Blackrainbow 黒い虹: Beautiful and strange Japanese shoes: "Jika-tabi (地下足袋)"
Beautiful and strange Japanese shoes: "Jika-tabi (地下足袋)"
I saw so many different and curious things in Japan. Some of them were totally amazing. Now I am back in my country I regret i didn't buy a pair of JIKA TABI. I still don't understand why I didn't buy them......Well, let me tell you what jika tabis are. 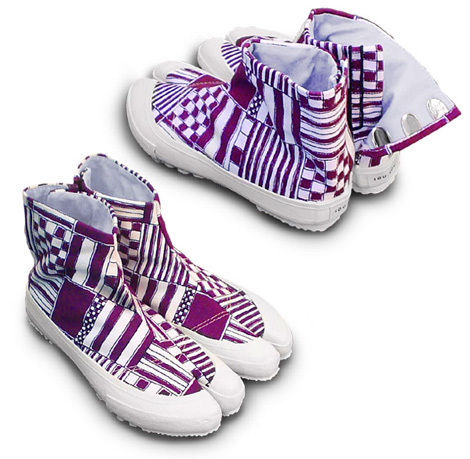 Jika-tabi (jee' kah tah bee) are Japanese worker boots. They have been used traditionally by construction workers, farmers, painters, road workers, and others since the late Meiji Period (around 1912). They are also worn during festivals and by traditional Japanese musicians such as Taiko drummers. We believe that the sleek designs and comfortable fit of jika-tabi make also them ideal for everyday attire. Now lots of people are using jika tabi because they are so cool. Jika-tabi come in a variety of types, colors, and styles. The traditional fastening device is a series of metal tabs (kohaze) that hook into a series of loops. A 12-tab tabi reaches about half way up to your knee (which is why they are sometimes called tabi "boots"). Laced, velcro, and zipper versions are also available. The sole of traditional jika-tabi are made of pliable natural rubber. 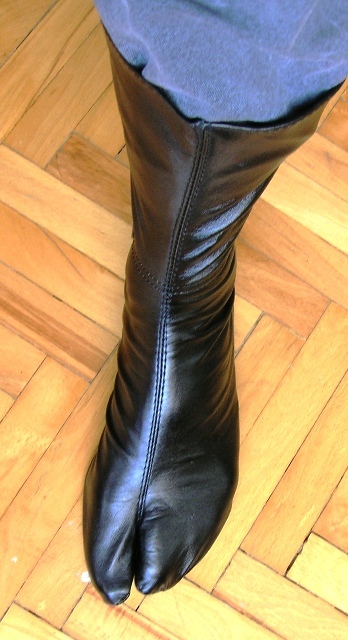 Soft enough to be flexible, but stiff enough to protect the wearer's foot from ground debris (remember that they are traditionally working boots). The rest of the shoe is constructed entirely of lightweight and breathable cotton except where noted otherwise. The most distinguishing aspect of jika-tabi is no doubt the split-toe design that separates the big toe from the other toes. This feature enhances their comfort, stability, and is a great conversation starter. For me they are great and they look cool. 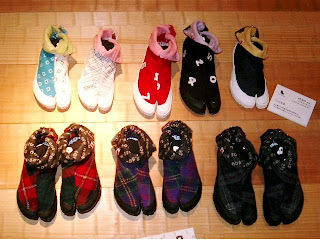 I promise to buy a pair of jika tabi in my next trip to Japan. Why didn't you buy a pair of those shoes?? ?